The Cunard Steamship Society has long been a proponent of establishing a monument to Samuel Cunard on the Halifax waterfront. 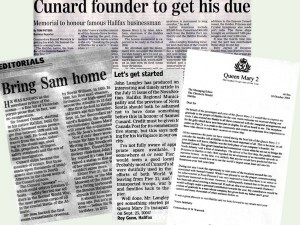 The issue gained considerable momentum last Fall when Society Patron and Cunard Commodore Ronald Warwick voiced support for such an initiative in a letter addressed to the Halifax Chronicle Herald newspaper following the inaugural visit by the QM2 to this port on September 25, 2004. 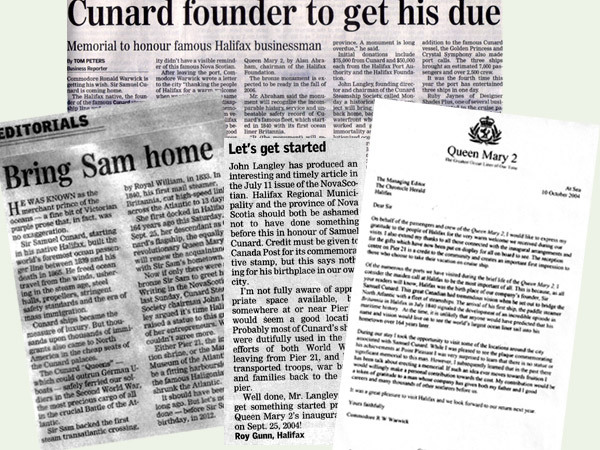 His challenge was then taken up by the Halifax Foundation which, in co-operation with the Halifax Port Authority is spearheading the drive to construct a statue of Halifax native and company founder Samuel Cunard.